Obviously I’d be with you bringing up the rear 🙂 I couldn’t rush by those flowers, are you the only photographer in your group? Hello. Catching up on blogs I haven’t visited, and I’m pleased to find your fascinating article. 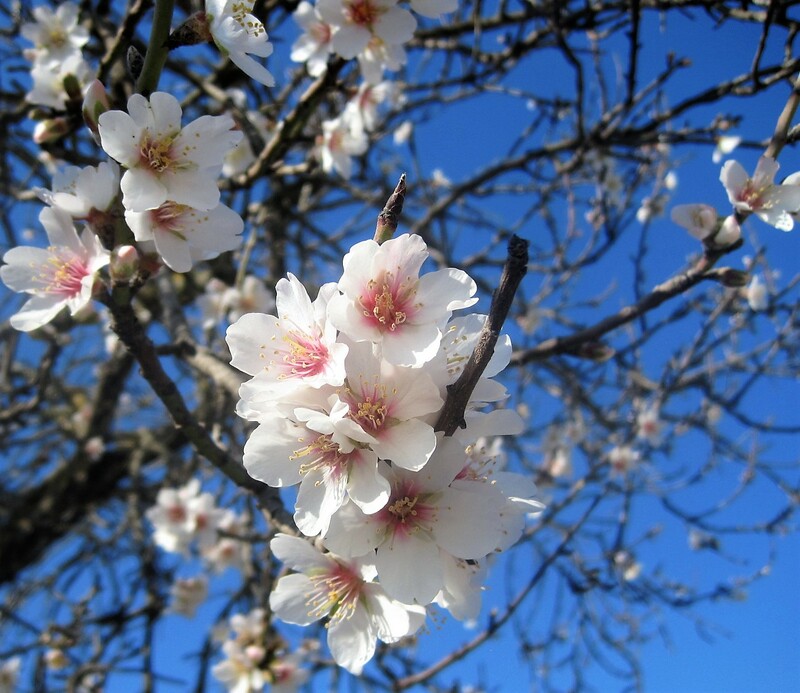 The almond blossoms are excellent photos. Happy travels. Hi Brad! Nice to see you 🙂 🙂 I don’t spend so much time on the blogs as I used to. As you can see, there’s plenty to do in the lovely outdoors here. Many thanks to you! Thanks, darlin 🙂 🙂 Always good to have your company. 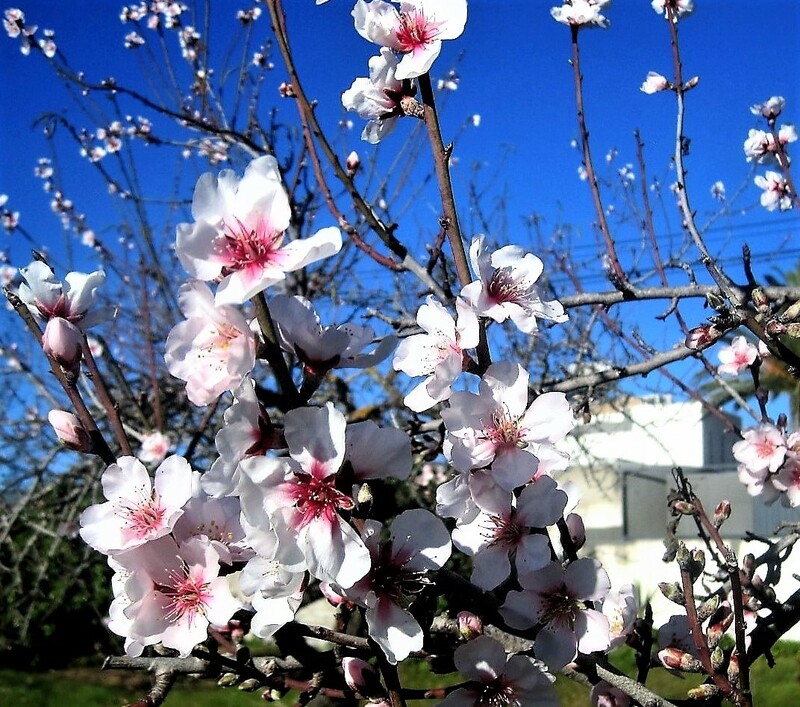 I would love to experience those almond blossoms in person. Beautiful. The whole walk — including cake 😉 — looks delightful. Ad, I’ve just come from an hour and a half language lesson. Life would be idyllic without them. 🙂 🙂 Happy to watch Rafa tomorrow. The almond blossoms are gorgeous, the cactus is … kinda weird (but very cool), and the boats are my kind of scene (even in sludge!). Great walk, Jo! I’ve never skied, Lisa, and I’ve got pretty bad coordination so it’s probably just as well. 🙂 🙂 Sunshine suits me much better. The blossoms remind me so much of our apple orchard when it was in bloom. I could look at it everyday and still be amazed at how pretty it was. Even when the petals fell, the orchard floor then became a white carpet. What a lovely walk and yes, you were very lucky with your dessert. It just lifts the spirit, doesn’t it, Karen? 🙂 🙂 I have some lovely old photos that I brought here with me, of our son as a toddler, sitting in a wonderful carpet of pink blossom. What an oncredible blue sky. One almost feels it’s fake but I know the Algarve can produce such wonderful skies. Glad you are enjoying it all. This looks lovely, and the sun! The photos of blossom are delightful! PS. Is this an old walk? Almond blossom?? ?